Sun-hyung Lee, who is starring in the TV series. Kim's Convenience that centers on a convenience store run by the first generation Korean immigrants to Canada and illustrates their settlement story has become a symbol of Canada that best portraits its society. This glorious winning of the awards shows how the series is loved by Canadians. Furthermore, in terms of social influence as well as popularity, the winning is meaningful as the series has improved Canadians’ awareness of diversity, greatly touching their emotions. “Representation matters. 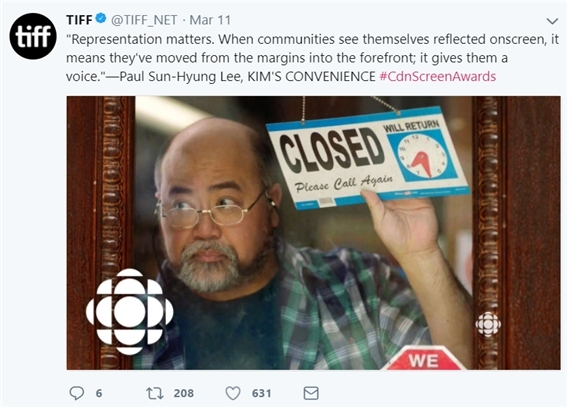 (Applause) I think that shows like Kim's Convenience prove that representation matters. When communities and people see themselves reflected up on the screens it is an inspiring and a very powerful moment for them because it means they've been moved from the margins into the forefront. And it gives them voice. When you give people a voice, other people start listening. And when people start listening, things start to change. (Pointing to the #AFTERMETOO badge on his jacket) And here is this little button. It means a lot. It's time for us to listen. Paul Sun-hyung Lee won the Best Lead Actor Award for the second consecutive year following last year for his role as dad in “Kim's Convenience.” This series first met Korean immigrant audiences as a play by Korean writer Ins Choi and soon attained popularity among them. They supported and cheered for this play which resembled their own story, that is, the story of the first generation Korean immigrants to Canada. Korean churches and other Korean communities used to watch this play in groups. However, no one was expecting that the story of their settlement in Toronto often faced with hardships would win the best comedy series award and the best lead actor award at Canada's leading screen award. 'Kim's Convenience' began to gain recognition among the public at the Toronto Fringe Festival, the city's representative theater festival, and it was televised as a comedy sitcom series at CBC in 2016, which earned it an immense popularity. It was nominated for 11 awards at the CSA in 2017, and Lee and actor Andrew Phung received the Best Lead Actor and Best Supporting Actor Awards in the comedy series category, respectively. Thanks to this popularity, season 2 of the series was aired starting in September 2017, and it was again nominated in 12 categories at the 2018 CSA. 'Kim's Convenience' beat 'Working Moms,' 'Letterkenny,' 'Michael: EveryDay,' and 'Nirvana the Band and the Show' and won the Best Comedy Series Award. It has recently confirmed the production of season 3 at CBC. In 2017, Lee's acceptance speech focused on 'family' and 'humanism,' the series' main themes that made it loved by Caucasian Canadians beyond representing the emotions of immigrants from various countries, including Korea. Soon, 'love' and 'humanism' have become the two key words that can best describe Canadian multi-cultural and multi-ethnic communities. In the summer of 2017, when Soulpepper, a theater company where Choi belongs, staged 'Kim's Convenience' for a month in Manhattan, New York, the drama was taken as a symbolic work that represents today's Canada, which celebrated the 150th anniversary in this year. And, at the 2018 CSA held on March 11, Lee came on the stage with the #aftermetoo badge on his jacket and presented a social message that raised the issue of social oppression and deprivation. I think this opportunity is even more special because it rarely happens to colored people (even in Canada). Until today, the daily lives of colored people have been never represented on the screen. That is why this opportunity is so precious to us. We support, encourage and help each other. Now no one can ignore our voice. I hope that Canada will support and lead this change. When we move forward, no one will be left behind in the shadow. The audience is hungry. In the matter of representation, media that have power can no longer ignore this. We should be able to use media with good intentions. Immigrant families can willingly send their children to the world only when they can see themselves on the screen. Kim's Convenience is a good sample. Diversity is the core of the community spirit that Canada has pursued and there have been many efforts to achieve it in all realms. Nevertheless, it was not until these days that the story of colored people started to be told by colored people themselves. During prime time when families sit in front TV together, Canadian families watch the stories of Korean immigrant families. Even in Canada where the policy of diversity and multiculturalism has long been implemented, it took a long time for it to gain the sympathy of ordinary citizens and for a story of immigrants to receive enthusiastic response of TV viewers. 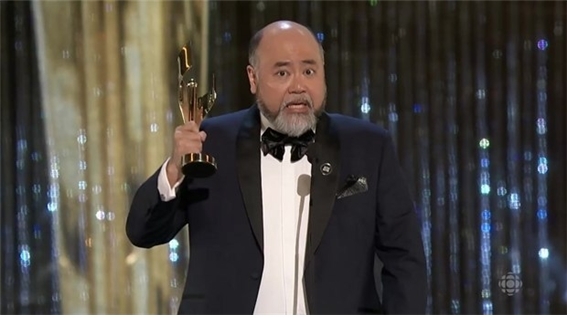 In addition to “Kim's Convenience,” the 2018 CSA drew attention with the issue of diversity, with Nabil Rajo who won the Best Actor Award in a film for his role in “Boost”, Ellise Bauman from the web series “Camilla” who received the Audience Choice Award, and 'The Secret Path' that was given the Best Document Award. It took more than the principles of majority and universality for the reality not covered by media to be reflected on the screen. Seen from Lee’s acceptance speech resonating with many Canadians, there needs to be someone to voice the uncomfortable reality and efforts to support the voice, to express solidarity, and to listen to the voice. Only with these efforts, every community can finally open themselves to media and to the screen as they are. Such an attempt has started among the second generation Korean immigrants in Canada. This suggests that the Korean community in Canada is well aware of the significance of voicing their reality. It is expected that they can continue to build a foundation based on which they can raise their voice in the Canadian society.